Students in grades one through four are taught in self-contained classrooms and are heterogeneously grouped. 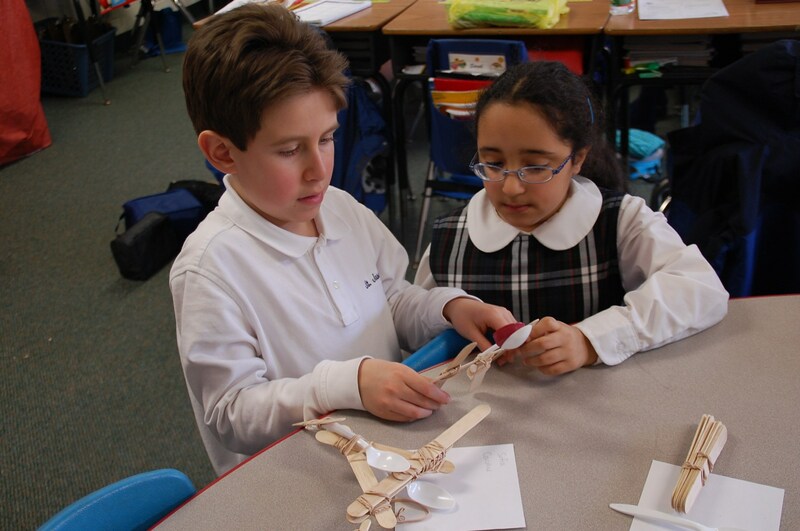 There is an emphasis on project-based learning and activities that require critical thinking and creativity. Encouraged to become responsible and independent learners, the curriculum focuses on language arts, mathematics social studies, science and religion. Conversational Spanish is taught twice a week by a Spanish teacher. The curriculum for literacy includes activities to enhance listening skills, speech, reading and writing. In addition, phonics, word recognition and comprehension strategies round out the program. Exposed to a variety of literary genre as soon as they begin to read, independent reading is encouraged as a life-long activity. Skills in grammar, mechanics, handwriting and spelling are honed through a variety of activities implemented in the writing curriculum. Students learn to draft, revise, edit and publish their work, necessary skills for each academic subject for which writing is assigned. To develop presentation skills, students have the opportunity to present their ideas orally in all academic classes. Weekly, students in grades one through three participate in the GRAB Program (Go Read A Book). The program requires an additional 15 minutes of reading for pleasure after homework is completed for the evening. A GRAB sheet is completed by the student, signed by the parent, and handed into the teacher, weekly. Exceptional small group mathematics instruction is provided within the classroom. Divided in half, the students in the class work with either the classroom teacher or the part-time mathematics teacher who provide a more individualized learning opportunity. The curriculum contains instruction in the various mathematics strands that emphasize critical thinking and problem solving. Manipulatives and other hands-on materials are used to enhance the learning process. The social studies curriculum for the first grade focuses on the study of community at work, the second grade focuses its learning on the people and places in our local communities as well as communities within our country, long ago. The third grade also has a curriculum focused on communities within our country at present time. The fourth grade focus of study is the state of New Jersey and includes the study of the geography and its regions. Much of the work in social studies is project-based with many units enhanced by field trips to area sites that add to the study of history. Life science, earth science and physical science are all part of the science curriculum in the first through fourth grades. Many hands on projects and lab experiments help to foster a love of science and add to the development of scientific concepts. Thematically based, the subject of religion is a developmental program based upon the teaching of the Catholic Church. Lessons on the Church, sacraments, and morality are taught by the teacher or a priest. Library skills, computer applications, vocal music, art and physical education are instructed by special subject teachers, with extra instruction provided for third graders who choose to learn to play the recorder and fourth graders who choose to study instrumental music and join the band. In addition, for those children interested in singing, a choir is provided for grades two through four.